For your edification from Muriel Delago, who just rang the doorbell at Van Alst House in Victoria Abbott's third book collector mystery The Wolfe Widow. You would not believe the state I found things in when I came to visit my oldest “friend”, Vera Van Alst. Not only was Vera herself looking like a drowned gerbil in a tattered old beige sweater, but the once beautiful home she lives in is falling to pieces. I can only hope she is taking better care of her valuable collection of first editions. Her "staff", and I do use that term loosely, consists of the Signora, a crazy old Italian chef, Kevin, the not-so-handy-man and a young woman who, in my opinion, is nothing more than a grifter for hire. She goes by the name of Jordan Bingham and she always has that ridiculous pug with her. Not to worry though, I have decided to stay for a spell. Vera has been convinced that it’s the right thing, perhaps because I know her darkest secrets. And I would enjoy spending some time with her Rex Stouts. It would be a "shame" if something happened to those Nero Wolfe first editions or to Vera. No need to worry though, I'm here now and there are going to be some big changes coming to Van Alst house. I’ve managed to have Jordan fired. Gone with her dog. So easy when you know how. I don’t want her meddling in my plans. Next those ridiculous Siamese cats will disappear. Then Kevin and the Signora. I can’t stand Italian food and the nosy handyman. By Thanksgiving, it will all be mine. That's just a few days away. Don’t you think it will be better that way? Victoria Abbott is a collaboration between Victoria Maffini and her mother, Mary Jane. 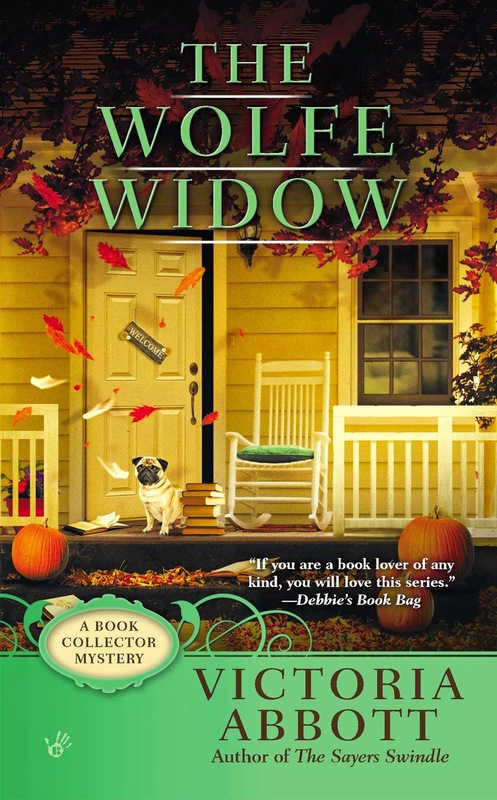 The Wolfe Widow is the third in their book collector mystery series. They are very excited about its release on September 2nd. Muriel, maybe you need to rethink whatever it is you're planning. Oh Muriel, we don't like you. And I think you are underestimating Jordan (and Walter). I can't wait to see you get yours ha ha. I can't wait to get my hands on the Wolfe Widow - literally! And since my mother's name is Muriel ........ I think she'll enjoy having such a nefarious character with the same name. Muriel, you are so evil. But the jokes on you if you think Jordan's "family" will let you get away with your sneaky plans. I can't wait to read how they will knock you down a peg or two or three or four for that matter. You are toast Muriel. Oh, boy! The Kelly clan will be on Muriel like a bug on stink. Can't wait for the book. Message from Jordan, currently hiding out: thanks everyone. Good to know you have my back. Hope to return the favor.